This is great for motorcycle owners. Slip the strap through your jacket sleeve and face of your helmet to secure both to your bike. Don’t have a Full Face Helmet? No problem, Slide the carabiner through the “D” rings of the helmet or the “V” strap of the helmet. 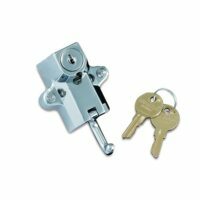 Lock multiple helmets, bags or other items securely to your motorcycle. Also great for the construction sector, use this strap to secure valuable machinery, ladders and tools to your vehicle, offering great piece of mind. The uses for this product are endless! !